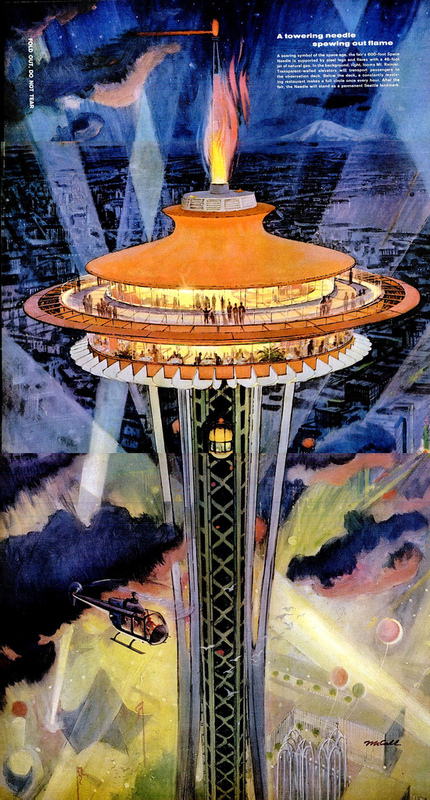 Could Seattle’s Space Needle become the symbol for the ‘New Space’ capital of the US? When Americans think of a place for outer space on Earth, Cape Canaveral and Kennedy Space Center come immediately to mind. That’s where the United States has launched most of the manned and unmanned space missions of the past half-century. Things are changing, however. While launches will always happen close to the equator because of the physics of rocketry, the intellectual center of gravity may be shifting catty-corner to the other end of the country. Seattle may soon vie for Florida’s “Space Coast” as the principal place where the country explores the possibilities of space. A group of enthusiasts, engineers, and business leaders argued the point at a recent meeting of the Space Entrepreneurs, a Seattle-area meetup that’s a little more than a year old. The two-dozen or so attendees, some of whom have seen everything since Sputnik, and a few were born born years after the Moon landings, debated the meaning of “old space” and “new space” as they surveyed the history of space exploration and utilization from the speculations of H.G. Wells to the investments of Elon Musk. Though the details are arguable, “old space” refers to the government and defense contractor-dominated space projects from the end of World War II through the present day. Kickstarted by the Commercial Space Launch Act of 1984, the Commercial Space Act of 1998, and later laws, “new space” took form as Congress decided NASA should not carry the entire burden of developing the country’s space capabilities. Fast forward to 2015 and the commercialization of space is rapidly gaining a foothold in the public’s imagination. As NASA takes the lead in the exploration of the planets, companies such as SpaceX and United Launch Alliance are poised to take over the routine activities of getting stuff into orbit and returning it to earth in one piece. Other companies are pushing forward with low-earth-orbit strategies of delivering services, such as Internet access and manufacturing, in space. The new captains of the space industry–Elon Musk, Jeff Bezos, Richard Branson, and others–need people and facilities to build these systems. Where will they find them? Seattle may be best positioned to fill these needs. The space-watchers at the meetup noted that an estimated 80,000 workers do various forms of space-related work within a 20-mile radius of downtown Seattle. The state’s Department of Commerce counts as many as 30 companies in Washington State working on space projects of one kind or another, with the nexus at Seattle. Next year, the Boeing Company will mark the 100th anniversary of its founding in Seattle; you can’t swing a cat without hitting a Boeing engineer in the Emerald City. The region has dozens of small factories supplying parts and services to Boeing, and space companies are likely tapping this resource already. Software engineers who could work on space systems are almost as ubiquitous as aerospace engineers, thanks to Microsoft’s generation-long footprint in Seattle. The city’s culture of risk-taking going back to the Alaska Gold Rush and its relative openness to new intellectual and cultural ideas creates a welcoming environment for investors and inspired leaders to try their hand at space. The investiture of Seattle as the “New Space Capital” is not inevitable. Though the area is rich in intellectual capital, qualified engineers are in short supply, and the meetup participants worried about the aging aerospace workforce. Software companies are capturing most of the young engineers; “New Space” will need a certain sexiness to turn their heads. Seattle also has serious transportation infrastructure problems (ask any commuter stuck in Seattle’s legendary traffic), and the region’s process-oriented political thinking could hamper forward progress. Despite these issues, no other area of the country approaches the critical mass of expertise, money, and entrepreneurial zeal for space as Seattle. Ten years hence, people may look back at the middle of this decade and comment how the focal point of space shifted to the Pacific Northwest. Check out my previous blog post about the new American heroes of space.